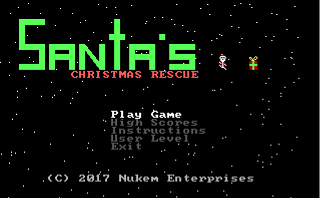 This is a Christmas game that I created to challenge myself to see if I could create a Qbasic game under a time frame of less than a few days. I tried to go all out with it and I think it came out pretty decent (Better than my previous Qb games at least). There's still many bugs left in the code to work out but I wanted to make sure that it was available on Christmas Day. Please let me know of any bugs you find on the forums and I will work on getting them resolved in the future. 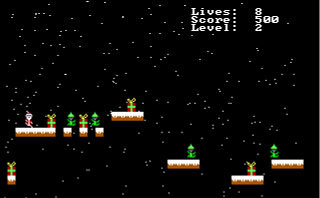 For those wondering what this game is, it's a platformer game where you collect presents and kill evil robot elves. There is also a level editor included so you can create and play your own levels on it. 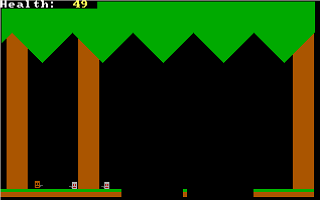 The regular game has 25 levels included. - Highscore name length increased. - Bonus present added worth 500 points. - Jumping under platforms higher than player now works correctly. - Levels reworked to include new bonus presents. Wry 3 is the third installment of the Wry series. 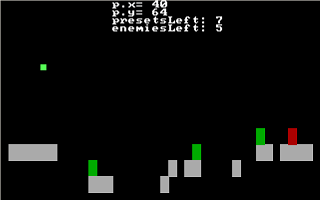 This version is a side view action game similar to Wry 2 but also includes multiple choices along the way in the form of text blocks to decide the players next move similar to Wry 1. All in all, I believe there has been about three full re-writes of this game's source code. Latest version can be found in the link below. This is an action RPG I've been working on. 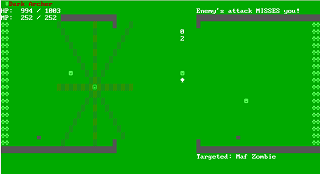 It's a top view ASCII game. The basic idea of the gameplay is that you pick one of three types of characters (Fighter, Mage, Archer), enter a level and fight your way to the boss. Beat the boss and move on. Well there's more to it then that, there's a story line and a save system. Each class also has very different abilities. It may sound a little "iffy" but if you played it you'd be surprised at how addicting it really is. "Just 100 EXP to the level 35! c'mon!" This is a survival horror Qbasic game, quite possibly the first. The story is sort of simple. You an your friends are camping and you doze off and when you wake up all you friends are dead except one, who is standing over you wielding a mighty axe. Running through the woods you make it to a deserted mansion. You run in a door and lock it behind you... You friend feverously bangs on the door.. eventually gives up, but there is a crash of glass from a room ahead. In this game you must solve puzzles and avoid being your crazed friends next victim. It's displayed in fixed camera angle perspective.